Seventeen years have passed since I lost my beloved spaniel Alix, who lives on in my heart and in my series as the inspiration for Sweet Pea. For seventeen years I didn’t believe I had enough heart left to offer another dog. Until now. 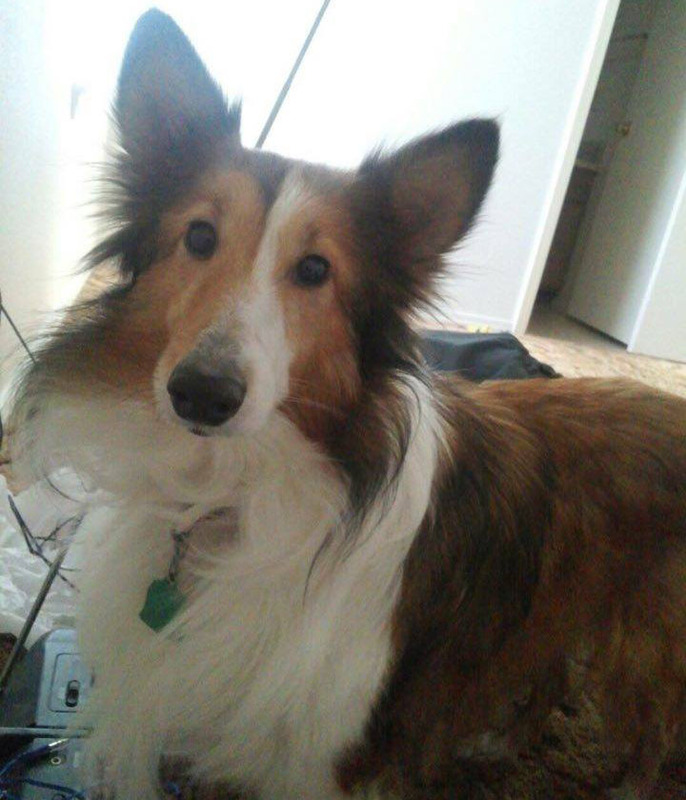 She’s a young Sheltie, likely less than two years old. She charmed everyone at the vet clinic and didn’t fuss at all about the exam, the blood tests, or even the inevitable medications needed to combat various minor maladies. She was a bit less sanguine about PetSmart, where I quickly realized she doesn’t like noise, probably hasn’t been socialized to men, and apparently didn’t want the bed I chose—although that might be revenge since I won’t allow her on my own bed, which is the domain of Buddy the Cat. Her coat is too thin in places and she’s in serious need of a groomer far more professional than I could ever be, but overall she’s in reasonably good health. She’s vocal (and then some!) when she sees another dog, which makes neighborhood walks a noisy adventure. She’s also clueless about walking on a leash, but in our two days together she’s already realized that heel is not an invitation to gallop! This gives me hope she’ll make quick progress in obedience class, which is a “must have” for us before we can even think about the Canine Good Citizen test. Never having had a Sheltie before, and being the total research geek that I am, I’ve ordered the breed guide and training book Shetland Sheepdog by award-winning author Sheila Webster Boneham and have turned to Sheltie owners, dog experts, and fellow dog writers for advice. I already owe special thanks to Susan Conant and Susan J. Kroupa (both award-winner authors and dog lovers) for their wonderful support and guidance. After 17 years I feel like a novice again, and am grateful for all comments, suggestions, and recommendations. (To share in the comments, you can either click on the word “comments” at the bottom of this post, or click on the post title and scroll down.) You’ll be seeing more of Sasha in future posts as I document our merry adventures in training. And count on seeing a Sheltie in a Waterside Kennels mystery sometime soon! 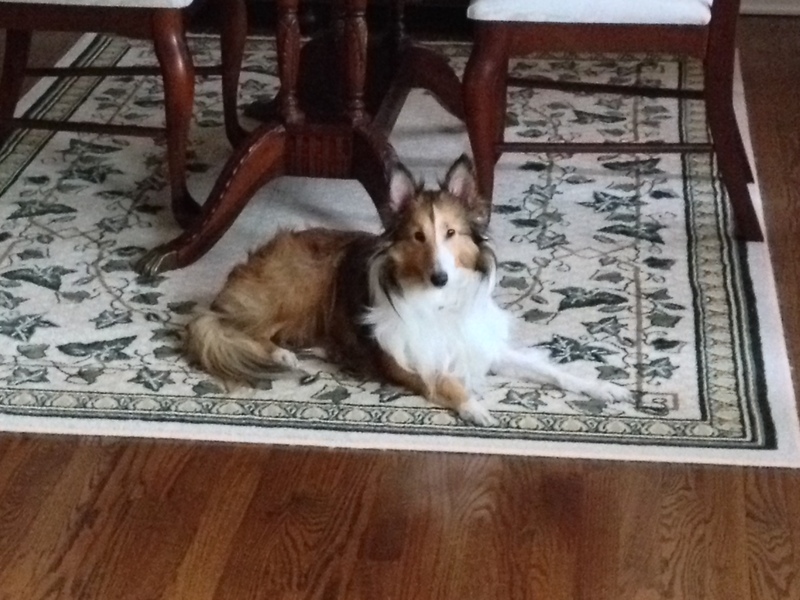 This entry was posted in About the Author, Dogs!, Home page and tagged adoption, Dogs, Health, Love, Rescue, Sheila Webster Boneham, Shelties, Susan Conant, Susan J. Kroupa, Training. Bookmark the permalink. Gooduck with your Shtie. They are known for be fast learners. Thank you! I just hope I can keep up with HER! You need to understand what the animal is thinking before you can train.They don’t always think like we do. I appreciate the information! She certainly seems to be adapting quickly to a new environment. I’ll be glad when we’re through with the medications so I can get a better sense of her true self. She hates the antibiotics for her ears in particular. Congratulations on the new ‘character’ in your life. She looks very sweet and I’m glad to hear her ailments were minor. How wonderful that she has found a home with you. June, thank you! She is a lovely dog, and I expect to be writing at length about this new addition to the household! Susan, what a lovely post. Sasha is a beauty! And how lucky she is to have come into your home. Good luck on this rewarding but challenging adventure! Sue, thank you! She’s settling in faster than I expected, although today will be the Big Challenge–I’m off to campus for the day. She won’t be alone of course but as she hasn’t let me out of her sight, I’m nervous! She reminds me of the lassie collie we had when I was a kid. If shelties are anything like lassies get ready for when they start moulting. You’ll have enough hair to knit a pullover.